Dentinal hypersensitivity (DS) is a common oral complaint in daily dental clinics which probably affects 8%–35% of the population. DS can be defined as pain arising from exposed dentin typically in response to chemical, thermal, tactile, or osmotic stimuli, which cannot be explained as arising from any other form of dental defect or pathology. 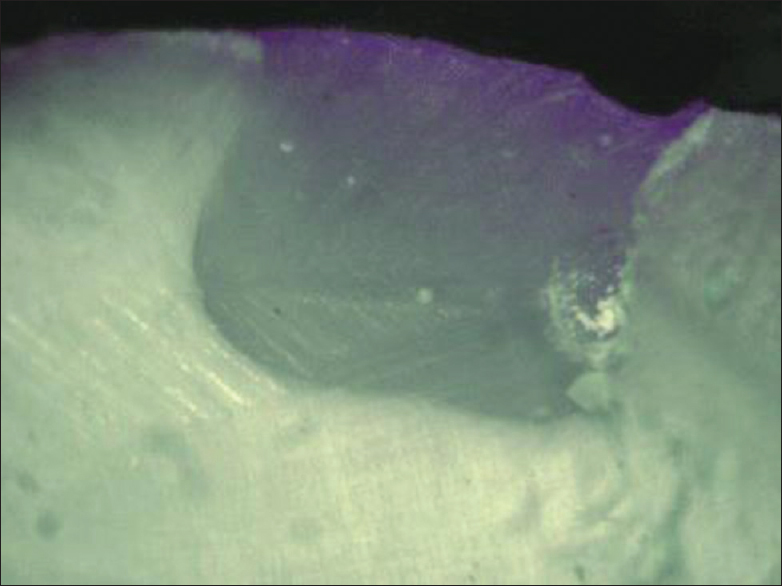 It occurs as a result of wear, caries, noncarious cervical lesions or after dental procedures such as cavity preparation or reduction of vital abutment teeth., According to well-accepted hydrodynamic theory, stimulus to the exposed dentin surfaces disturbs the fluid movement within the dentinal tubules and consequently stimulates mechanoreceptors at pulp-dentin border leading to pain sensation. Two calcium-based desensitizing pastes, casein phosphopeptide-amorphous calcium phosphate-containing paste (CPP-ACP, GC, Tokyo, Japan) and calcium sodium phosphosilicate-containing paste (Novamin, Smithkline Beecham Consumer Healthcare, Berkshire, UK), were used in this study. CPP-ACP combination localizes in the form of nanoclusters and causes remineralization of enamel at a much faster rate, by maintaining high concentrations of calcium and phosphate ions on dentin surface. Novamin, a calcium-sodium phosphosilicate bioactive glass has been developed for the treatment of hypersensitivity by the physical occlusion of dentinal tubules, recent studies have demonstrated a potential for this material to prevent demineralization and/or aid in remineralization of tooth surfaces. Self-etch adhesives are very attractive for routine use in a busy daily practice and less possible to cause sensitivity. Shorter clinical application time and less incidence of postoperative sensitivity have made self-etch adhesive systems, a promising approach when compared to the etch and rinse systems., It has been shown that morphology of dentin acid–base-resistant zone (ABRZ) was highly adhesive in self-etch adhesive systems than etch and rinse systems. Besides micromechanical interlocking through hybridization, specific functional monomers in mild self-etch adhesives were shown to interact chemically with the Ca2+ of the residual hydroxyapatite that remains available within the submicron hybrid layer. Likewise, the functional monomers may interact with Ca2+ contained in the desensitizer modified smear layer, potentially resulting in additional chemical bonding. In the literature, there are only few studies about the use of calcium-containing desensitizers evaluating the microleakage when used along with self-etch adhesives, but no up-to-date publication has been found that reports the microleakage of CPP-ACP and Novamin desensitizers using selective enamel etch technique. Hence, the current study aimed to assess the microleakage in Class V cavities restored with a mild self-etch adhesive (G-bond) using selective etch technique in combination with two calcium-containing desensitizers (CCP-ACP and Novamin). One hundred carious-free human premolars with intact enamel surfaces were used. After extraction, to remove tissue remnants, they were hand scaled and stored in 0.5% aqueous chloramine T solution under refrigeration until use. 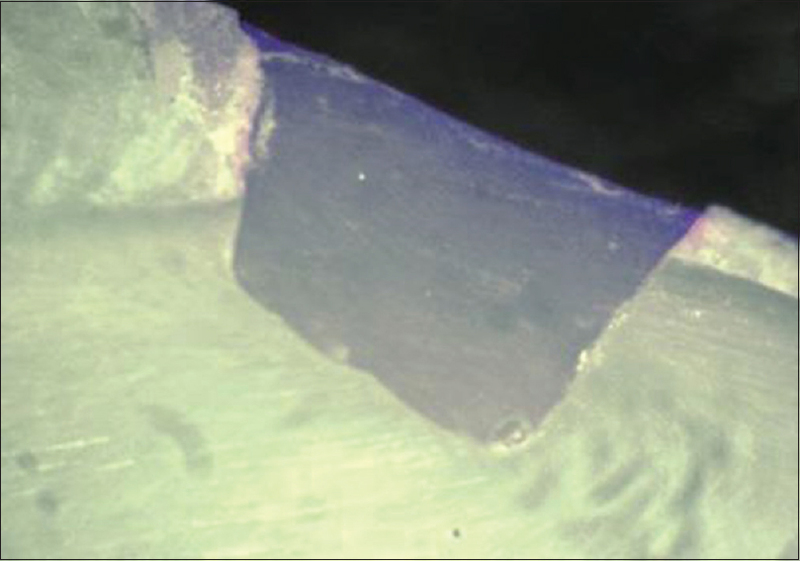 Class V cavities were prepared 1 mm above the cementoenamel junction on the buccal surfaces of each tooth, using a rounded cylinder diamond bur (Jota Ag Rotary Instruments, Ruthi, Switzerland, ISO no. 806,314,140,534,012) at high speed with air/water spray. The cavity preparations were standardized with a width of 5 mm, a depth of 2 mm, and a height of 3 mm. These distances were measured with a digital caliper (Digital Slide Caliper, Tchibo GmbH, Hamburg, Germany). Group 5: same as Group 3, but the desensitizer used was Novamin. The same operator performed all cavity preparations and restorations. All teeth were finished and polished using composite finishing bur 7901and Sof-Lex disks. All areas of the teeth were covered with two coats of acid-resistant nail polish, except the restoration and 1 mm rim around it. The apices were sealed with sticky wax and the teeth were thermocycled. Thermocycling involved submerging the teeth for 10 s in water baths maintained between 5 and 55°C for 500 cycles, then immersing them in 0.5% methylene blue dye solution at room temperature for 24 h, later removing them, and rinsing them under running water. Each sample was sectioned longitudinally in the middle in the buccolingual direction, using a diamond disc (Diamond Wafering Blade; Buehler, IL, USA) with a precision cutting machine (Isomet 1000, Buehler) under water cooling to attain two equal halves. The degree of marginal leakage was evaluated based on the penetration of the dye stain from the cavosurface margins to the base of the cavity preparation. Each specimen was viewed under a stereomicroscope (Olympus SZ61, Munster, Germany) at 30X magnification. Dye penetration to the base of the cavity and beyond. Statistical analysis was performed utilizing the Kruskal–Wallis test followed by Mann–Whitney test. All the statistical tests were performed at a P < 0.05 level of significance. The mean microleakage values were presented in [Table 2], [Table 3], [Table 4], [Table 5], [Table 6], [Table 7]. Stereomicroscopic images of all groups are shown in [Figure 1], [Figure 2], [Figure 3], [Figure 4], [Figure 5], respectively. None of the groups showed the complete absence of microleakage. Among all the groups tested, control group has shown high microleakage scores (P < 0.05). There was a statistically significant difference between the Groups 2 and 3, while Group 3 showed less microleakage (P < 0.00). Among the Groups 4 and 5, Group 5 showed less microleakage. No statistically significant difference was observed between two desensitizers tested are presented in [Table 5], [Table 6], [Table 7], respectively. 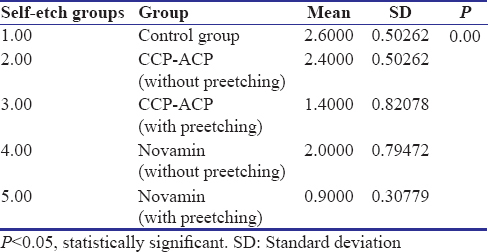 The present study investigated the effect of CCP-ACP and Novamin on microleakage, with and without preetching enamel (3 s only) of all-in-one adhesives. Our results showed that none of the groups in the study could completely eliminate the microleakage. 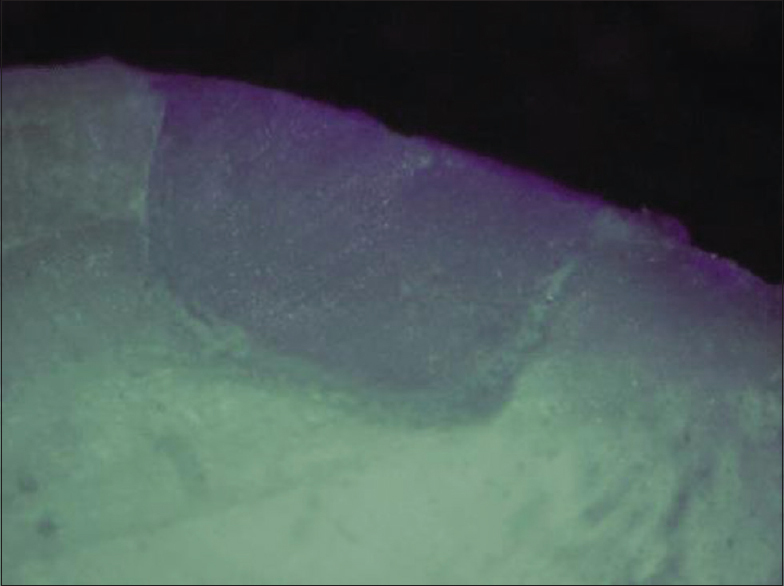 Despite continuous improvement of adhesive systems, microleakage is still a major concern in restorative dentistry and deserves considerable study. Good marginal sealing the through use of appropriate desensitizers and adhesive systems can help to eliminate microleakage and reduce postoperative sensitivity. Adhesive systems have also been substantially improved, employing material specific formulations, and simpler application techniques. Single-step self-etch adhesives were chosen in the study as they do not remove the smear layer and the smear plugs, but only modify these structures, consequently the tubular orifices remain sealed by the plugs. It is believed that this mechanism of adhesion, that enables bonding without exposing the dentinal tubules, is responsible for eliminating microleakage and thus postoperative sensitivity. 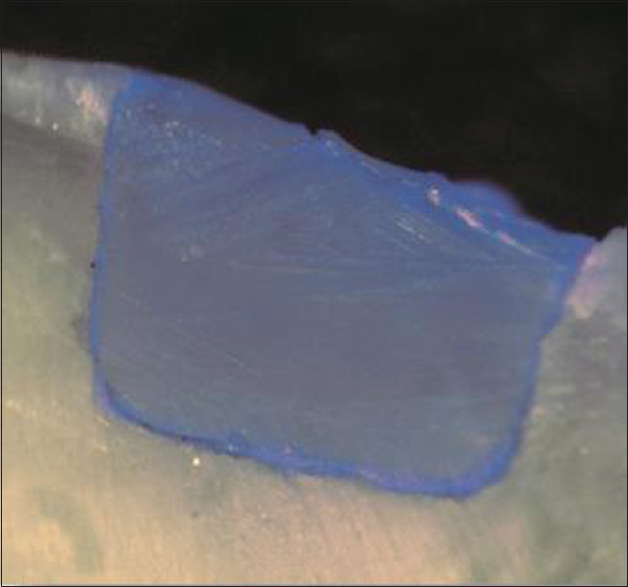 Scanning electronic microscope observation at dentin–adhesive interfaces reported the presence of an ABRZ beneath the hybrid layer after acid–base challenge in all-in-one adhesives was better in comparison to total-etch adhesives. G-Bond used in this study contained the functional monomers 4-methacryloyloxyethyltrimelliticacid (4-MET) which have been reported to contribute to resin-dentin bonding. Potential interaction of calcium contained in the desensitizers and 4-MET results in the production of additional chemical bond. Pei et al., 2013 reported that microtensile bond strength of G-Bond was not influenced by pretreatment with CCP-ACP-containing paste. Although the single-step self-etch adhesives are easy to use in the present day dental practice, there are shortcomings and could not completely eliminate microleakage. It was shown that when using all-in-one adhesives, the margins of restorations in enamel were worse than the margins of restorations where phosphoric acid was used. Our study results have shown that there was statistically significant reduction in microleakage in preetched Groups (3 and 5) with either of the desensitizers (CCP-ACP and Novamin) which might be because of preetching of enamel (3 s) with phosphoric acid attacks the hydroxyapatite crystals, partially eroding them, and creating a porous and retentive structure on the surface. Therefore, the acidic functional monomers may be able to bond chemically to preetched enamel as effectively as to dentin. Results of the present study have shown higher microleakage scores in Groups 2 and 4 which could be because hydroxyapatite crystals within enamel are considerably larger than those within dentin which interfere with acidic functional monomers further affecting the chemical bonding when compared to dentin. This is important for clinicians who are concerned about the additional time required for using phosphoric acid preetching with all-in-one adhesives. Yang et al., 2018 have evaluated the tubular occlusion of CCP-ACP and Novamin, the CPP-ACP-treated dentine presented the formation of numerous crystals on the dentine surface, with occluded tubules. The square average roughness values presented by atomic force microscopy values were increased which indicating more wet surface and lower contact angles, which favors of mechanical interlocking and adhesion, hence they were chosen in this study. In terms of functional mechanisms, CPP could stabilize ACP on the dentine surface after CPP-ACP treatment; Ca2+ and PO43− maintained at high concentrations in the hybrid layer, thereby forming an ion osmotic gradient and promoting the remineralization of the hybrid layer and demineralized dentine. In Novamin-treated dentin, Na + exchanged with H+ or H3O+ and the pH increased, which resulted in the continuous release of Ca2+ and PO43− from Novamin to form microcombination with the original hydroxyapatite crystals for reinforcing the hybrid layer, which is in accordance to previous studies.,, This speculations can be tested by further research in vivo on a long-term basis.In vitro and clinical studies of different desensitizers with selective enamel-etch technique in all-in-one adhesives have to be proven for better marginal sealing. Application of CCP-ACP or Novamin without pre-etching could not eliminate microleakage. Desensitizers application followed by preetching for 3 s on enamel have significantly reduced microleakage than unpreetched groups. This new generation all-in-one adhesives with minimal preetching time (3 s) on enamel may be a preferable method for improving the marginal sealing of cervical restoration. Gillam DG, Mordan NJ, Newman HN. The dentin disc surface: A plausible model for dentin physiology and dentin sensitivity evaluation. Adv Dent Res 1997;11:487-501. Perdigão J, Geraldeli S, Hodges JS. Total-etch versus self-etch adhesive: Effect on postoperative sensitivity. J Am Dent Assoc 2003;134:1621-9. Auschill TM, Koch CA, Wolkewitz M, Hellwig E, Arweiler NB. Occurrence and causing stimuli of postoperative sensitivity in composite restorations. Oper Dent 2009;34:3-10. Brännström M, Aström A. The hydrodynamics of the dentine; its possible relationship to dentinal pain. Int Dent J 1972;22:219-27. Gupta A, Tavane P, Gupta PK, Tejolatha B, Lakhani AA, Tiwari R, et al. Evaluation of microleakage with total etch, self etch and universal adhesive systems in class V restorations: An In vitro study. J Clin Diagn Res. 2017;11:ZC53-6. Pei D, Liu S, Huang C, Du X, Yang H, Wang Y, et al. Effect of pretreatment with calcium-containing desensitizer on the dentine bonding of mild self-etch adhesives. Eur J Oral Sci 2013;121:204-10. Guentsch A, Seidler K, Nietzsche S, Hefti AF, Preshaw PM, Watts DC, et al. 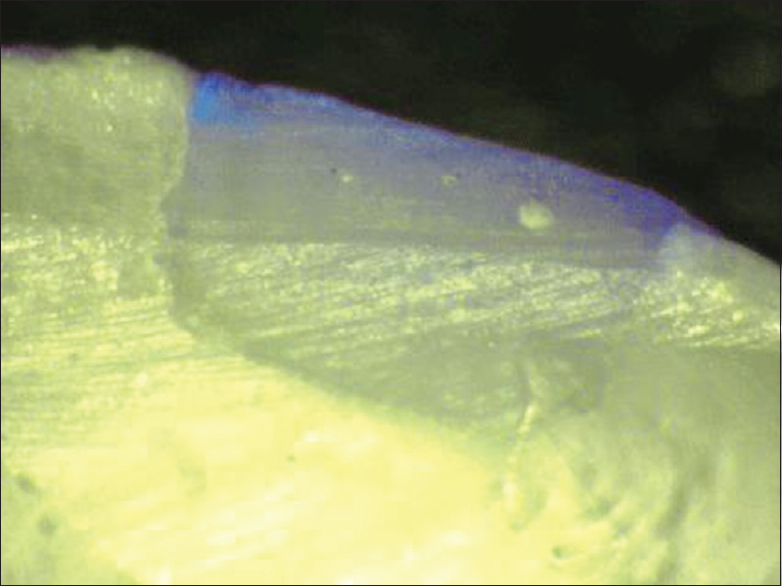 Biomimetic mineralization: Long-term observations in patients with dentin sensitivity. Dent Mater 2012;28:457-64. Shetty S, Kohad R, Yeltiwar R. Hydroxyapatite as an in-office agent for tooth hypersensitivity: A clinical and scanning electron microscopic study. J Periodontol 2010;81:1781-9. Yang H, Chen Z, Yan H, Huang C. Effects of calcium-containing desensitizers on the bonding stability of an etch-and-rinse adhesive against long-term water storage and pH cycling. Dent Mater J 2018;37:122-9. Van Landuyt KL, Peumans M, De Munck J, Cardoso MV, Ermis B, Van Meerbeek B, et al. Three-year clinical performance of a HEMA-free one-step self-etch adhesive in non-carious cervical lesions. Eur J Oral Sci 2011;119:511-6. Peumans M, Munck J, Van Landuyt K, Lambrechts P, Van Meerbeek B. Three-year clinical effectiveness of a two-step self-etch adhesive in cervical lesions. Eur J Oral Sci 2005;113:512-8. Giannini M, Makishi P, Ayres AP, Vermelho PM, Fronza BM, Nikaido T, et al. Self-etch adhesive systems: A literature review. Braz Dent J 2015;26:3-10. Van Meerbeek B, Yoshihara K, Yoshida Y, Mine A, De Munck J, Van Landuyt KL, et al. State of the art of self-etch adhesives. Dent Mater 2011;27:17-28. Toledano M, Osorio R, de Leonardi G, Rosales-Leal JI, Ceballos L, Cabrerizo-Vilchez MA, et al. Influence of self-etching primer on the resin adhesion to enamel and dentin. Am J Dent 2001;14:205-10. Rotta M, Bresciani P, Moura SK, Grande RH, Hilgert LA, Baratieri LN, et al. Effects of phosphoric acid pretreatment and substitution of bonding resin on bonding effectiveness of self-etching systems to enamel. J Adhes Dent 2007;9:537-45. Ozsoy A, Eren MM, Gurbuz O, Dikmen B, Cilingir A, Erdemir U. Effect of desensitizers on the microleakage of previously restored Class V resin composite restorations. J Adhes Sci Technol 2016;30:2201-11. Demirci M, Tuncer S, Tekçe N, Erdilek D, Uysal Ö. Influence of adhesive application methods and rebonding agent application on sealing effectiveness of all-in-one self-etching adhesives. J Esthet Restor Dent 2013;25:326-43. Hussein TA, Bakar WZ, Ghani ZA, Mohamad D. The assessment of surface roughness and microleakage of eroded tooth-colored dental restorative materials. J Conserv Dent 2014;17:531-5. Owens BM, Johnson WW. Effect of new generation surface sealants on the marginal permeability of class V resin composite restorations. Oper Dent 2006;31:481-8. Waldman GL, Vaidyanathan TK, Vaidyanathan J. Microleakage and resin-to-dentin interface morphology of pre-etching versus self-etching adhesive systems. Open Dent J 2008;2:120-5. Nazari A, Shimada Y, Sadr A, Tagami J. Pre-etching vs. grinding in promotion of adhesion to intact enamel using self-etch adhesives. Dent Mater J 2012;31:394-400. Tsujimoto A, Barkmeier WW, Takamizawa T, Latta MA, Miyazaki M. The effect of phosphoric acid pre-etching times on bonding performance and surface free energy with single-step self-etch adhesives. Oper Dent 2016;41:441-9. Tsujimoto A, Fischer N, Barkmeier W, Baruth A, Takamizawa T, Latta M, et al. Effect of reduced phosphoric acid pre-etching times on enamel surface characteristics and shear fatigue strength using universal adhesives. J Adhes Dent 2017;19:267-75. Burwell AK, Litkowski LJ, Greenspan DC. Calcium sodium phosphosilicate (NovaMin): Remineralization potential. Adv Dent Res 2009;21:35-9. Du Min Q, Bian Z, Jiang H, Greenspan DC, Burwell AK, Zhong J, et al. Clinical evaluation of a dentifrice containing calcium sodium phosphosilicate (novamin) for the treatment of dentin hypersensitivity. Am J Dent 2008;21:210-4. Rajesh KS, Hedge S, Arun Kumar MS, Shetty DG. Evaluation of the efficacy of a 5% calcium sodium phosphosilicate (Novamin) containing dentifrice for the relief of dentinal hypersensitivity: A clinical study. Indian J Dent Res 2012;23:363-7.